Who needs a Costume? By when? Dress rehearsal will be on the 17th! Our children will be performing at our "Christmas Pageant" on Thursday, Dec. 17th at 6:30 p.m. Mr. Nolting, our Music teacher, has been working hard to prepare the children K-8th grade for this memorable event. Pre-K 3 and Pre-K 4 are also learning to sing a Christmas carol each for this night with the help of their teachers. Pre-K 3 children will be singing "El Burrito Sabanero" and their costume will be shepherds. 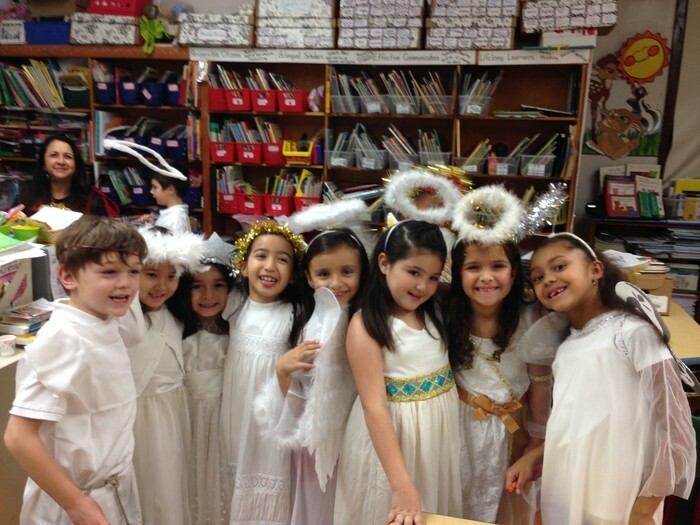 Kindergarten and First Grade students will be angels. You will need to come up with a costume for your child. 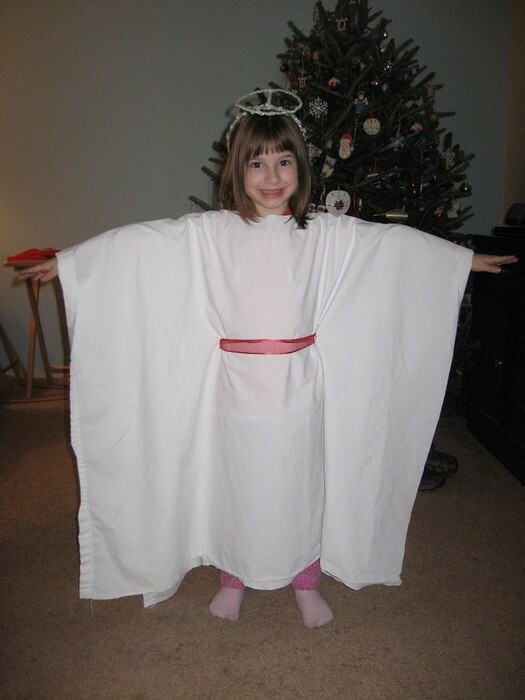 I have included some ideas for making angel costumes that do not require sewing. See below for ideas and pictures. Second and Third Grade students will be shepherds. Please note below how to make shepherd costumes that do not require sewing. Fourth Grade students will be singing "We Three Kings." Three students will dress up like Kings and the rest will dress up in Winter Christmas colored hats, scarves and gloves. They may wear Christmas dress-up clothing. Mrs. Ramos will let her students know this week who will be a King. King costume can be made using the video mentioned below. You may want to use fabric that shimmers. The rest of the band members (24) will be asked to wear dark pants and a white shirt for boys and a white blouse for girls. 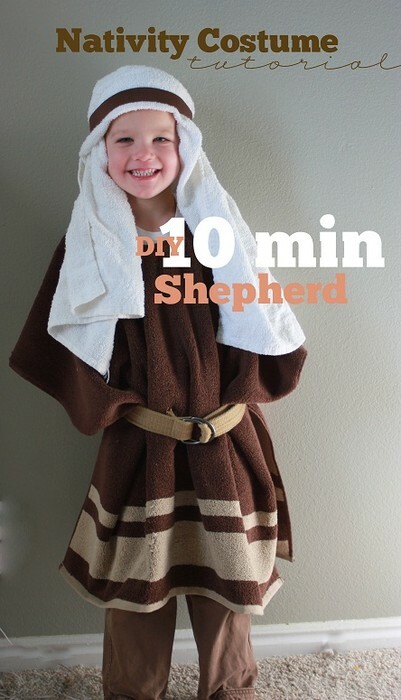 Shepherd costume ideas: If your child owns a bath robe, all you need is a pillow case to place over head and put a headband to hold it or yarn rope you can tie around the forehead. Another idea for the little ones is to take an old adult size towel, cut a hole for the head, slip over body and tie waist with rope or belt and wear a smaller towel to cover head with a fabric tie to hold the head covering on. See picture below. There is also a basic pattern for making a robe with a glue gun and a pair of scissors. You can use an old sheet and rope to tie around the waist. See video below. 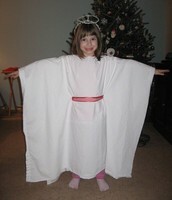 Angel Costume ideas: See video for making a bible robe like the one for the shepherd. You can use a white bed sheet or fabric store fabric. Angel wings patterns can be found on Pinterest or on the website provided below. Use tinsel for head cover and you can buy dollar store fairy wings or make them. Mr. Nolting would like to meet with parents interested in helping decorate the stage for the pageant. He would like a meeting after school on Monday and Wednesday of next week at 3:15 on the stage. Amy Canche would like to help chair a decorating committee after speaking with Mr. Nolting on Monday. This is the time parents to get those Volunteer hours and help at our school. Also, if you are willing to donate the costume for next year's pageant, it would be greatly appreciated. Thank you parents for all your support and time to help us out with costumes. Using an adult towel cut a hole and slip head through the hole. Use another towel for the head. 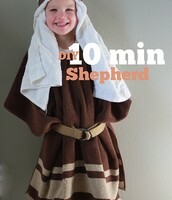 The bible tunic video on youtube mentioned below can also be used to make a shepherd robe. Fold a piece of fabric in half. Cut a hole for head and two smaller holes to slip a piece of ribbon through it around the wasitline. Making a bible tunic and angel wings. Watch how easily you can make a tunic for a shepherd or angel with scissors, glue and a piece of fabric on the youtube video. 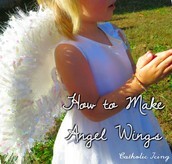 Catholicicing.com shows an easy way to make angel wings.